You know it right away. When you walk in a restaurant and the hostess doesn’t catch your eye. It happened the other night…it was a LONG night as we waited for our food and made the best of it. 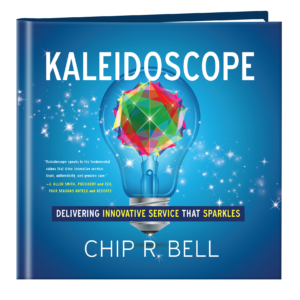 The leadership of that restaurant could benefit from reading author and customer service guru’s Chip Bell’s books, especially his latest one called Kaleidoscope. It is a quick read with deep ideas like how to deliver a “masterpiece” and “deliver with candor.” I love this guy and his books. And so will you. In The Genius of Opposites, I write about the exponential power of opposites. In my case, it is introverts and extroverts, who through their different perspectives and styles emerge with stronger solutions than they might have alone. Chip writes that by challenging our staid thinking we emerge with truly innovative customer service solutions. There is an old conflict resolution technique by which opposing parties have to articulate the other person’s view as if the two had swapped positions. It is useful in clarifying misunderstandings, misinterpretations, and erroneous facts. It is a clear and present manifestation of standing in another person’s shoes. The technique is a powerful tool for innovative service. It is turning everything upside down and around to find new ways to deliver a profoundly delight-filled experience to those you serve. What if we used drones instead of trucks for deliveries? What if the doctor came to you? What if the guests controlled the theme park experience instead of the park cast members? What if the car drove itself? What if a wearable—shirt, watch, or headdress—managed the vital workings of your life? We love to talk about managing differences—introverts vs. extroverts, old farts vs. upstarts, men vs. women, or democrats vs. republicans. But looking at the world from a dramatically different perspective led to the decline of the flat earth society, barbers as bleeders, and the horse as the best mode of transportation. If turned a circus into a Cirque du Soleil, a bookstore into an Amazon, and a Big Boy Burgers into a Chick-fil-A. Opposites can be the birth of innovative service‹the kind customers experience as having the charm and attraction as a toy kaleidoscope! It takes courage and curiosity. It requires the pursuit of paradigm-breaking experimentation. And, it takes embracing the fact that value-unique (ingenuity borne of difference, not sameness) is a far more powerful marketplace differentiator today than value-added (giving customers what they expect plus a little more). Disruptors get comfortable with dissonance and shun the way we’ve always done it.˛ While we all enjoy the ease of “birds of a feather flock together,” the winners are the embracers of “opposites attract’. This entry was posted in Uncategorized on February 14, 2017 by Jennifer Kahnweiler.